Simulators have always been a huge part of gaming, but it wasn’t until games like Goat Simulator came out that the genre took a turn for the absurd or, in many cases, the mundane. The Weather Factory‘s Cultist Simulator ($6.99), which has finally made the journey from PC to mobile, both continues and subverts the trend. 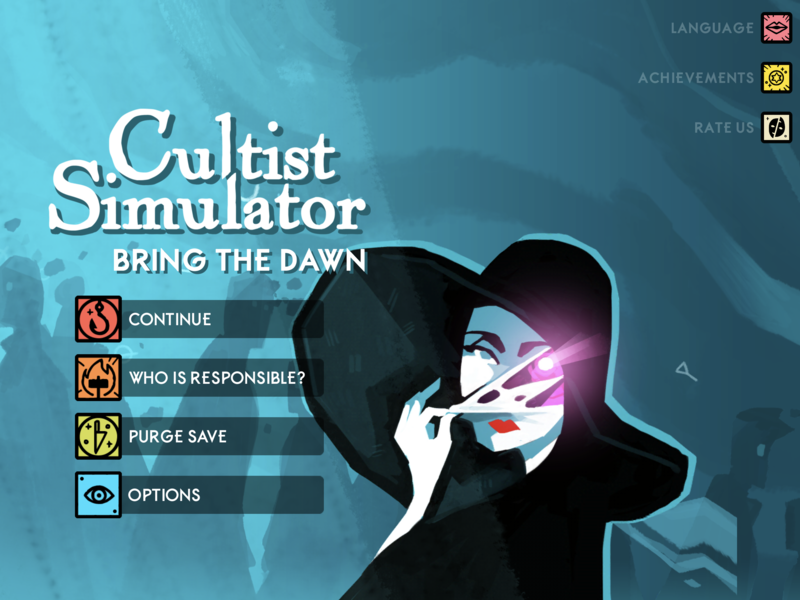 Yes, in the most literal sense of the word Cultist Simulator does indeed simulate founding and running a cult, but at the same time my fraying sanity (I was after all dabbing in demonic rites) makes any sense of accurate simulation absurd, and that’s part of the game’s fun. If you’re into games that trade hand-holding for exploration and games where the mechanics perfectly match the theme — even if that results in occasional confusion and challenging cause-and-effect scenarios — you’ll really enjoy Cultist Simulator. The game is partly the brainchild of Alexis Kennedy, of Fallen London and Sunless Sea, so expect some great writing. And since this is a card game at its core, it fits a touchscreen so much better than it does a computer screen. Reviewing a game whose main source of enjoyment is exploration and discovery is challenging; I can’t tell you too much about the game without spoiling big and small discoveries that are what make it fun to begin with. Yet, just as a cultist balancing between sanity and madness, I’ll do my best to walk that thin line. Cultist Simulator is an innovative take on the simulator genre where the player explores the game world and takes actions by positioning a large variety of cards on “verb" squares, the latter having one or more spaces for card placement. For instance, by sliding a card that describes an occupation onto the Work square, my character goes to work and makes money. As I perform various actions, more verb squares appear, which introduce new narrative options and effects into the game. 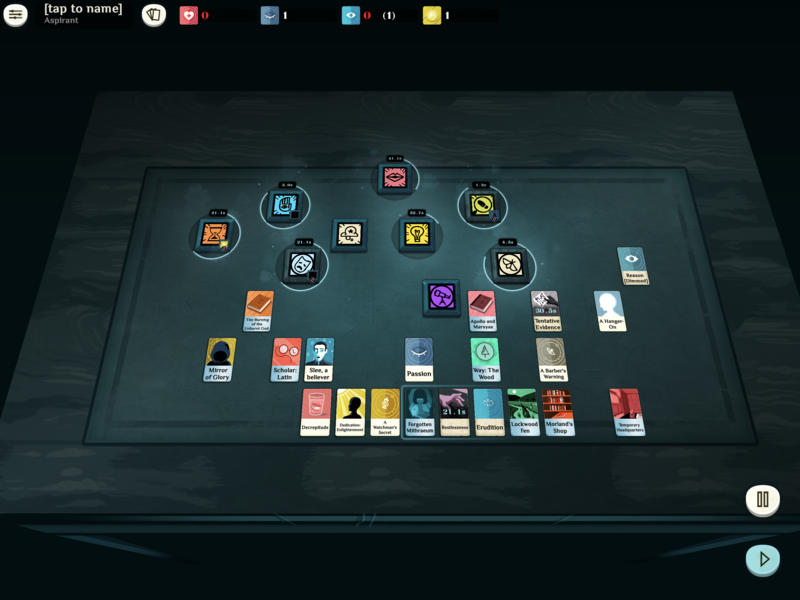 My actions will very often result in new cards that I can add onto my table, since instead of having a deck like in other card games, in Cultist Simulator all my cards are laid on the table in front of me. The game runs in real time, with actions taking a few seconds each, but when it all becomes too much to take in, it can be paused. Sounds simple overall, doesn’t it? Well, just like being part of a cult, things can quickly spiral out of control and my actions would often have unclear, even menacing results. And that’s part of the fun. As this is at its heart a branching narrative game with multiple paths and many different endings, Cultist Simulator offers plenty of replaybility, including some roguelike elements that tie your various runs together. While the primary mechanic of adding cards to verb squares is quite simple and easy to immediately understand, it all soon becomes challenging to figure out and predict. Some of the verb squares for instance will pull cards to themselves without me initiating any actions (imagine actions pertaining to everyday sustenance for instance). There are over a dozen card types — skills, dream paths, books, sensations, tools, ambitions, etc — and their interactions can be quite unexpected. The game does help you make sense of these interactions by allowing you to tap either on a card or an empty space to get more information on the types of cards you can use and the result of your various choices. However, in keeping with the theme of exploration and of the mental confusion that comes from reading too many books on cult rites, the game keeps its explanations on the vague side. While I appreciated the rewards of exploring such an intriguing and complex world — both in terms of narrative and mechanics — I know this kind of game won’t be for everyone. The good thing about Cultist Simulator is that it does reward your efforts and time and its lack of hand-holding perfectly fits the theme and story. While its gameplay and mechanics can initially feel obtuse, Cultist Simulator‘s interface and visuals are anything but. The visual style of the game is clear and attractive and nicely evokes the early 20th century aesthetic of the game’s narrative. The timers are also nicely done, allowing you to easily follow the action on the table even when there are numerous actions happening simultaneously. Overall, the game looks really sharp both on an iPad and an iPhone, and the tactility of dragging cards around feels right at home on the touchscreen. One of only a few issues is that when you zoom in a bit to keep better track of the various actions, you might miss a new verb square that popped up just outside your field of view. The game doesn’t offer any visual indicator that such a thing has happened, and that can lead to you missing important information. Speaking of important information, prepare to die a few times just because you didn’t realize the timer around one of the squares is pretty much a countdown to you losing that round. The only way you’ll know is the red tint and pulsating of the numbers as they count down. In a way this manner of perishing fits within the theme and does make sense mechanically — after all, you’re fighting for your sanity and delving into mysteries better left undisturbed. Still, it does get a bit frustrating and is something I needed to keep in mind as I learned the game more. If you don’t mind — or if you really fancy — games that drop you in an intriguing world without almost any guidance (the game does offer a short manual that helps you figure out how to play while also taking some of the fun away) but reward your efforts with an innovative mix of clever mechanics and dark narrative, you should definitely pick Cultist Simulator up; there’s truly nothing like it on the App Store right now. The game unfolds in entertaining and challenging ways that I can’t share in great depth (again, I would be spoiling a lot of the fun if I did so), but I will say that what starts as a simple card game becomes a story-creation engine that includes summoning alien gods, sacrificing friends and foes alike, founding cults, and much more. Just be prepared to discover this world as you go along, as long as you don’t mind losing your sanity (thankfully only in terms of the game) along the way.